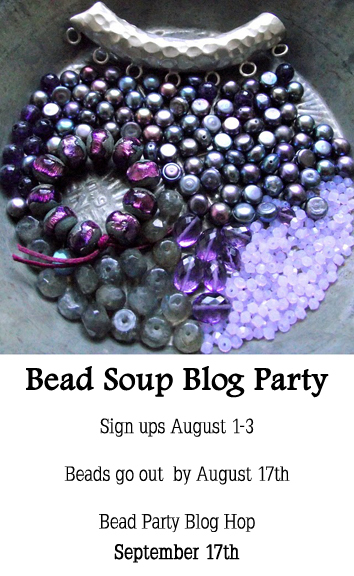 If you're like me and still hopping around trying to finish off the last of the soup, you can click this link for my Bead Soup Blog Party post or scroll down to find it. 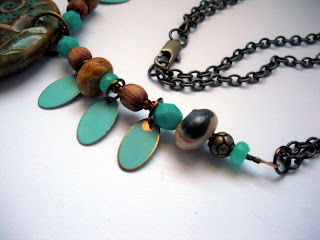 Of course, you could always stick around for today's post, which centers on the topic of my bead soup. Your choice. . .no pressure. 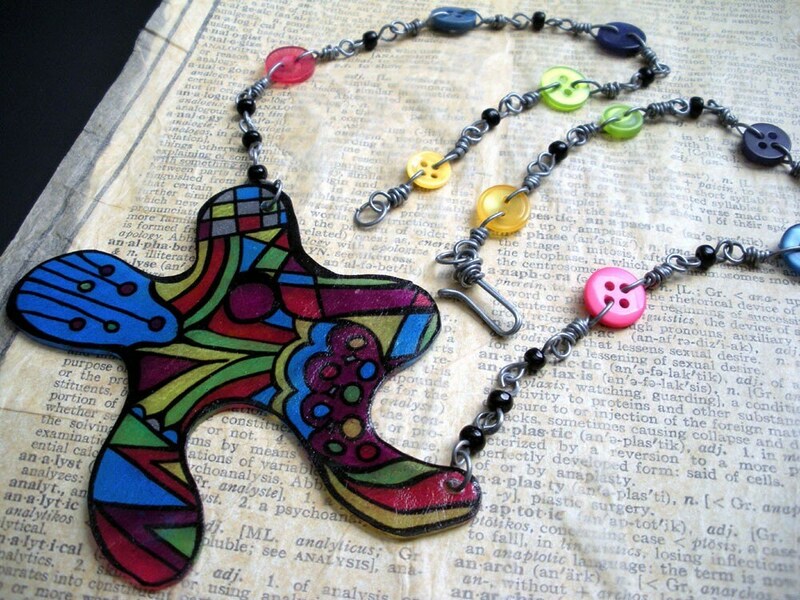 First, to those of you who came, saw, and commented on my Bead Soup pieces I send a big, big THANK YOU!! Thank you for the encouragement, thank you for the kind words, thank you for visiting. I sincerely appreciate it. As I've already stated, I'm still making my way through the list. I've only got about 70 more blogs to visit. So, if you haven't gotten a comment from me yet, don't worry. There's only a few I HAVE NOT left comments on and that's only been because I couldn't for some reason (technological issues.) 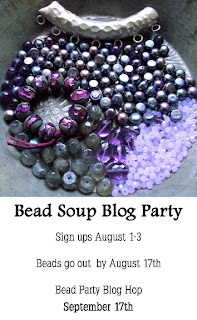 Let me go ahead and mention that Lori at Pretty Things (our Bead Soup hostess with the mostess), has announced the next Bead Soup Party. Here's what you need to know for now. Even though I haven't quite finished going through the list of blogs, I want to mention a few things I've learned so far from the Bead Soup Blog Party and give you some details. Going through the list of blogs has been very inspiring. I've seen techniques and styles and color combinations that I would have never considered. I've read stories about about how the pieces were conceived and details about how they were made. I've read lists of the soup components used and what was added in each jewelry piece. And then, I hung my head in shame because my post had no back story, no heart, no depth. Let me correct this. Patty sent me a BEAUTIFUL combination of beads and copper findings (as well as other little treasures). She even sent me TWO focals from which to choose. I pondered her package for a few days, thinking I was only going to make one piece. I knew that the object of this bead soup was to challenge ourselves. As such, I gravitated toward the large copper focal. This was an item I would not normally use in my work and one that would stretch me outside of my comfort zone. I didn't want to draw too much attention away from the copper flowers. Therefore, I decided to go with a take-off of a rosary chain. 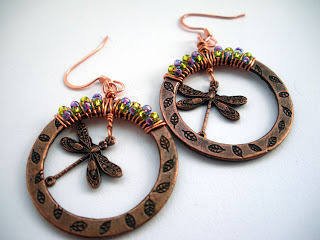 I made the beaded links with copper wire I had on hand. For the beads, I used the etched jasper, crazy agate, dyed nuts, and wood beads that Patty had sent along with some other glass, stone, wood, and plastic beads from my personal stash. 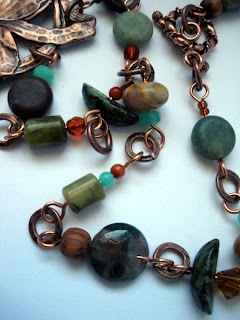 Instead of just connecting the beaded links to each other, I used links of the antiqued copper chain from Patty as jump rings to add more copper to the piece. Initially, I had just the one main line of chain off the focal, but felt that it really needed something else. Making a few more beaded links and connecting them to the open spaces on the side of the focal up to the main chain just seemed natural to me. 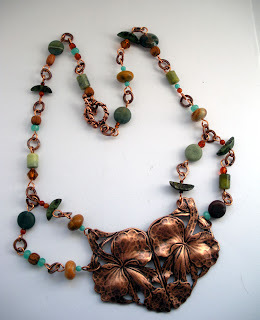 I used the antiqued copper toggle clasp from Patty to complete the necklace. Once that piece was completed, I thought I was done. However, Lori herself commented to me that I could always make more than one piece. That bit of information festered in my brain until last week when I jumped on the rest of those beads and copper bits like they were a grenade. Since I knew that I wanted to wire wrap some beads onto the rings, I decided to just use the same wire to get the dragonfly to hang. It was tricky and I wasted a LOT of wire working on this method. But, I eventually got that dang bug to hang the way I envisioned. Once the aggravation of that was over, it wasn't but a thing to wrap the wire around the ring and add some seed beads. [I've had some questions about how I made these and am toying with the idea of doing another video/tutorial, so stayed tuned if you're interested.] Let me mention that the choice of bead color alluded me for a bit. I had assumed I would used a turquoise-y tone much like in my other pieces. But, I thought maybe I was becoming too predictable in my color choices. So, I pulled out a bunch of seed beads. The bright lime green called to me first. It was then a matter of finding something that would compliment both lime green and copper. I thought I was in a pickle until I stumbled on those pink/purple beads that had never seemed to match anything. To me, those two beads together looked much like the colors found on a dragonfly wing. Do you see it too? Just me? Oh well. Oddly enough, my Bead Soup partner, Patty, also used the same copper rings and dragonfly charms to make similar earrings. That cracks me up! I had my favorite piece in the soup for last; that ceramic focal. 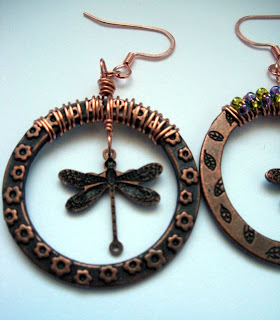 I had used SO MUCH copper on the other two pieces that I really wanted to stray from that vein. Instead, I found myself leaning toward antiqued brass. 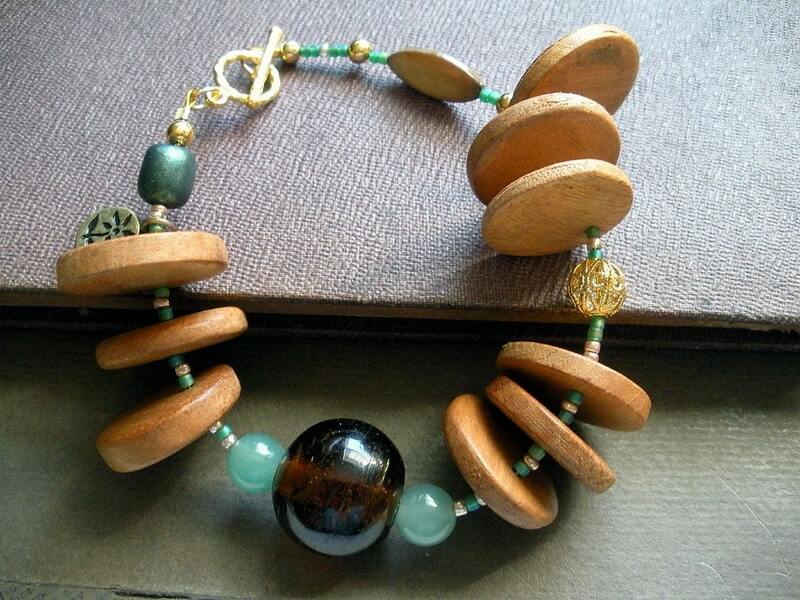 I also wanted to use a few more of the beads Patty sent since they matched the tones in the focal's glaze. 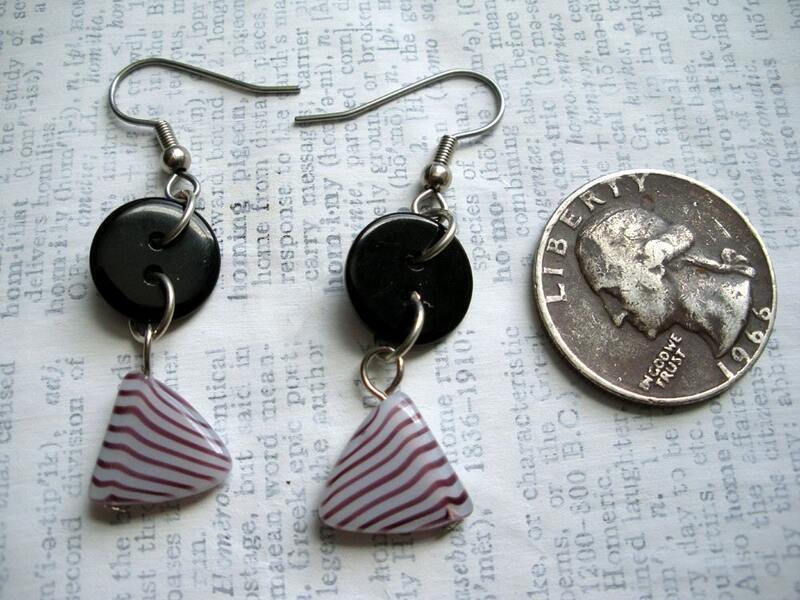 I feel a lot better now that it's explained that there was a method to my madness in making these pieces. There is some OTHER news in my bead-y world than just the bead soup party. Let's get to those while the day's still fairly young. I created an Etsy Treasury (my second one ever) in honor of March 1st. Since March begins tomorrow, this cliche has been bouncing around in my head all day. Needed to get it out with a treasury. As well, three items in the shop were placed on sale. One is reserved for now. I had intended to share some links today, but I think this post is plenty long enough. Don't you? Beautiful work! I think both necklaces are amazing! 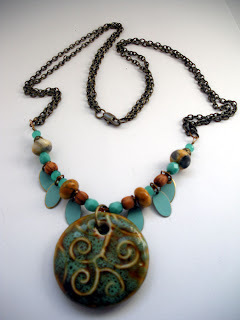 The necklace with the ceramic pendant is my favorite! Thanks so much Jeanette. That one's my favorite as well! Beautiful! It was great hearing your thought/design processes. I think that's one of my favorite parts about this tour. Genea and Karen - Thanks so much for visiting. I'm glad you liked my explanation. Please visit again.